President Muhammadu Buhari has despatched a congratulatory message to the Super Eagles on their outstanding 3-1 victory over Algeria in the African qualifiers for the 2018 World Cup in Russia. A statement from the spokes person of the President, Mr Femi Adesina said Buhari joined “millions of football loving fans in the country in celebrating the very-much improved national team for meeting our expectations during the entertaining and action-soaked encounter. “The President commends the team and its handlers for displaying uncommon strength, determination and high professionalism in the onward and steady progress to the 2018 tournament in Russia. 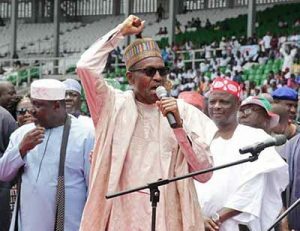 “With six points in our kitty from two impressive wins, President Buhari assures the team that the Federal Government; and indeed all Nigerians will continue to support them to make the nation proud.